This week I was out of town for a few days with my husband (he had a business trip) and we had the loveliest time hanging out with old friends that live in that area. I had this brilliant not-so-clever idea to bring the least amount of beauty products possible, because I have a history of packing waaay more than the necessary. However, it turned out to be a disaster. I brought some tiny samples of products that I had not used before and returned home with the nastiest skin rash I have ever experienced. I am now much better, but oh boy, it was awful. More deets below. Empties. I am down to my last few pumps of YULI Halcyon Cleanser and I plan to repurchase it. While I prefer more creamy products to massage my face in the evening, this cleanser offers significant benefits that other cleansers do not. First: it carries no risk to clog the pores, because it rinses off completely as it is water-soluble. Second: it is a clear, lightweight, and runny gel that does not make my hair line dirty, which is perfect for the morning cleanse. It is free of harsh cleansing agents like soap and sulfates, yet it cleanses perfectly. I was so used to cream and oil cleansers that I did not appreciate the texture of Halcyon at first, but it has grown on me so much. I can’t even remember the last time I used a face cleanser that I could just slap around my face and quickly rinse off with a splash of water. It feels good to be able to do that again and know that I am not stripping my skin. Repurchases. My obsession for the Osmia Organics Hand Creams has reached a whole new level since last week. I purchased a second one for myself (the spicey, rose-scented one) because I would hate to run out of it and not have a back up. I also picked one to send to my sister in Italy and will get one for my mother-in-law as well. Cold months are upon us and after experiencing the “Polar Vortex” several times last year, I am frightened at the idea of not being prepared for it. Hair Care on Trial. I am currently using the Rare Elements Pure Shampoo that I mentioned last week and while it is a great shampoo that leaves my hair soft, bouncy, and properly cleansed, it does not seem to offer much volume. I plan on using it a little longer before writing a more in depth review, but so far it seems to be a great shampoo, just not very volumizing. Makeup on Trial. I mentioned that I picked the Antonym Black Eye Pencil (shade is called Noir) two weeks ago, which is described as a waterproof eye pencil. It is very pigmented and applies beautifully–not creamy, but not too hard either. Overall, I am happy that I purchased it and it is my eyeliner of choice. However, while it does not smudge and does not give me raccoon eyes, I find that it does fade a bit throughout the day on warmer, more humid days. It is probably water-proof, (does not come off with water/tears), but if you have oily lids and live in warmer climates, it may not look flawless all day long. Definitely better than any of my other “natural” eye pencils, though. Lipstick Love. I have two lippies to mention as my favorites for the past week. 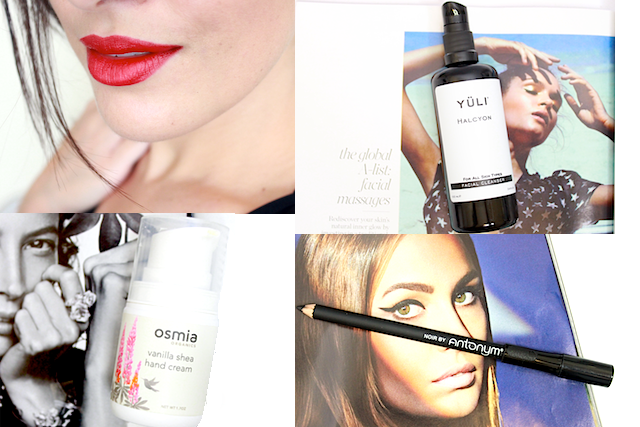 First, the Ilia Beauty Strike It Up Red Lipstick I wrote about in my last post, which is the perfect red lipstick. Second, the Tata Harper Lip Treatment Be Adored, which is a very sheer, raspberry color with a very comfortable, moisturizing texture that keeps my lips soft on colder, more dry days. Product of the Week. The Dr. Alkaitis Organic Soothing Gel, for the reasons mentioned below. Disappointing Product. After I started to use and love the Kure Bazaar Nail Polish in Cappuccino, I picked a few more Kure Bazaar nail polishes, including their Final Touch Top Coat. The nail polishes are all awesome: beautiful colors, great formulas, good pigmentation, and glossy finish. However, I was very disappointed in the top coat because it takes too long to dry, at least to my liking. Ain’t nobody got time for that. If you need a 5-free top coat that dries quickly, try the Priti NYC Speedy Dry Top Coat instead. I included a few photos of what my skin looked like on my second day with the skin rash I mentioned above. 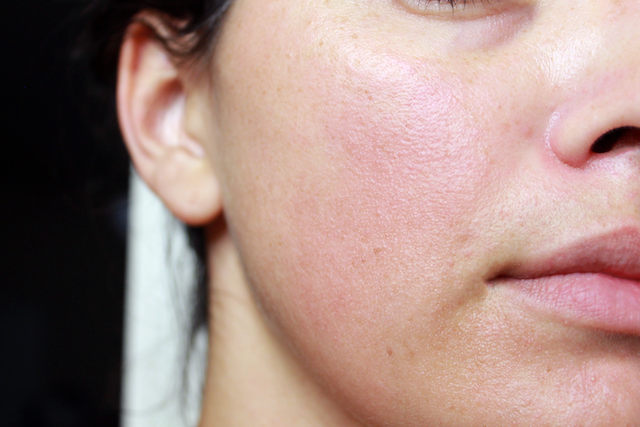 The photo does not even show how red and inflamed my skin was because I used a photography light that washed me out. 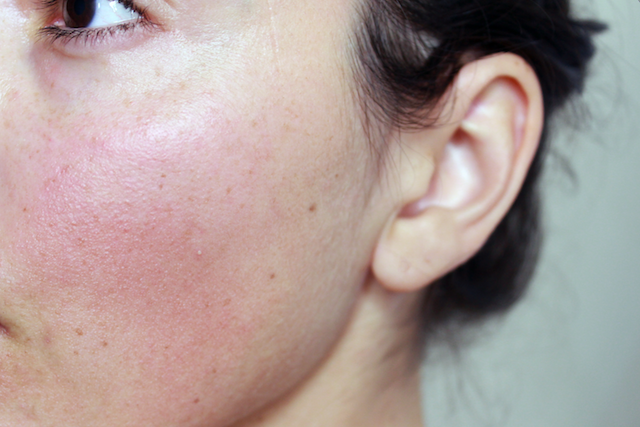 My skin is by no means perfect, (I am wearing no foundation, so you can also see my infamous dark spots), but I was horrified at what the texture of my skin looked like during the rash because my skin is usually pretty smooth. It felt very hot to the touch and very, very itchy, and I even had a few tiny whiteheads on my cheeks, which are so unusual for me. I also had a red patch under my left eye that looked similar to the rash on my face. The samples I that I used for the previous two days were the Tata Harper Rebuilding Moisturizer and the Tata Harper Eye Cream. I was very sad to experience that reaction because they felt absolutely amazing on my skin upon the application and under makeup, and they smelled so lovely. However, my skin must not agree with some ingredient in both formulations, (the ingredients of the fragrances, maybe?). Has anyone else experienced this with those products? I have used the Tata Harper Resurfacing Mask and the Regenerating Cleanser for the past month or two with no issues, but won’t be purchasing any of the moisturizers, obviously. If you are interested in Tata Harper’s moisturizers and have sensitive skin, you may want to sample the products and patch-test before purchasing a full-size. Also, the Dr. Alkaitis Organic Soothing Gel was the only product I applied on my face that really soothed my skin with a cooling, calming effect. A must-have for any skin irritations, and perfect to soothe freshly shaved skin. Sales. The Detox Market is offering free shipping on all U.S. orders for three days with code TRICKORTREAT for the next two days. Do your hands a favor and order that Osmia Organics hand cream.